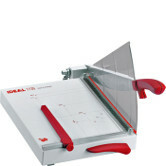 Paper Cutters that are lever style or guillotine style are ideal for cutting many sheets of paper at once. They are very safe, reliable and simple paper cutters to use. The operator simply lowers the lever handle across the documents. Safety features such as finger guards and safety latches provide safety to the user. 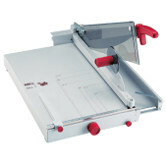 We are pleased to offer top brands of paper cutters, including Martin Yale and Kutrimmer. Whether you are looking for a commercial grade or desk top model, these high quality paper cutters carry the features and precision tools guaranteed to produce excellent results with the highest level of safety. Please contact a product specialist at 1-800-808-2377 for any further information about the selection of paper cutters we carry. 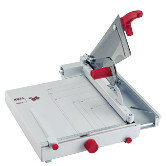 Please browse our more extensive selection of Paper Cutters, Binding Machines, Laminating Machines, and Supplies. We guarantee you won't be disappointed. The Martin Yale Premier W12 12" Paper Cutter is a wood base guillotine paper trimmer that is designed for multi-purpose paper cutting. It accurately cuts paper, matte board, cardboard, film, tissue, and textiles up to 11-3/4 inches wide. The Martin Yale Premier W15 15" Paper Cutter is a wood base guillotine paper trimmer that is designed for multi-purpose paper cutting. The heavy-duty 3/4" thick wood base and through-hardened steel blade provide accuracy and stability. The Martin Yale Premier W18 18" Paper Cutter is a wood base guillotine paper trimmer that is designed for multi-purpose paper cutting. A permanent 1/2" grid and dual English and metric rulers help to ensure proper alignment. The Martin Yale Premier W24 24" Paper Cutter is a wood base guillotine paper trimmer that is designed for multi-purpose paper cutting. A patented automatic blade latch locks with every cutting motion. The Martin Yale Premier W30 30" Paper Cutter is a wood base guillotine paper trimmer that is designed for multi-purpose paper cutting. A permanent 1/2" grid and dual English and metric rulers help to ensure proper alignment. The Martin Yale Premier W36 36" Paper Cutter is a wood base guillotine paper trimmer that is designed for multi-purpose paper cutting. The heavy-duty 3/4" thick wood base and through-hardened steel blade provide accuracy and stability. 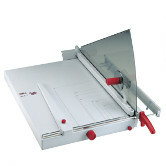 The Kutrimmer 1135 is a sturdy, all metal guillotine cutter that is designed for many years of reliable service. The Solingen steel blade set may be resharpened when needed to extend its useful lifetime. 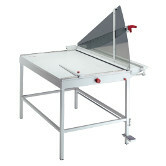 This is a deluxe table—top cutter that can easily cut larger paper thickness. Fast and precise adjustment for desired sizes with the variable position back gauge. The Kutrimmer 1046 Table Top Paper Trimmer can precisely cut up to 30 sheets of 20 lb paper. The 1046 can cut paper up to 18" in Length. 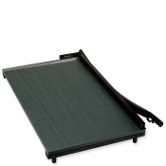 A built in clamp keeps paper in place while cutting while the guard and no skid rubber feet make this paper cutter extremely safe to use. 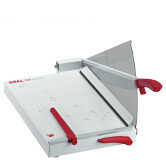 Easily cut larger paper thickness with this fast and precise table-top machine. 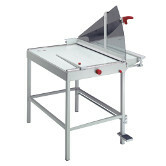 Paper trimmer with variable position back gauge. Trim hairline edges with the utmost safety and ease. This is a heavy duty kutrimmer that makes for effIcient preformance. It handles many tasks with ease. This is the largest kutrimmer with a 44" special high-grade steel blade.